How much does the Fed actually care for the lives of it’s soldiers? If recent admissions by the Pentagon are any measure, very little. Soldiers KIA overseas were allegedly given honour upon their arrival at a military base in Hawaii. The problems? The flag-draped coffins contained no bodies. Many of the planes were shuttled into position as props because they couldn’t fly. The bodies of the fallen were actually kept detained. 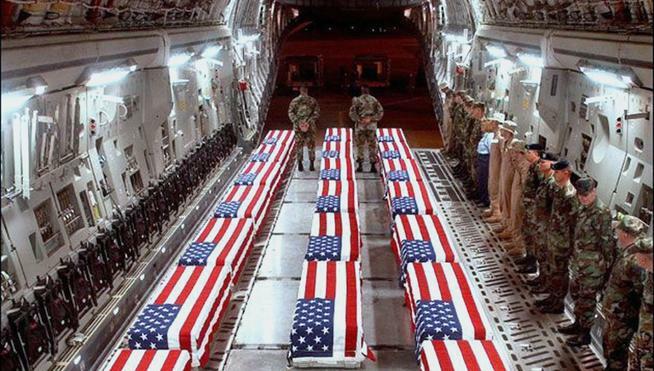 When the Fed finally got around to it, how did many soldiers’ bodies arrive? Because nothing says honouring the dead by putting on a farce complete with empty coffins. Making the average citizen feel good must trump any disclosure of truth. Just ensure everyone thinks we’re rolling along nicely in our pleasant little wars. The Fed/Brass can’t have the populace know just how they treat our boys!